Overview: What are Voluntary Benefits? One of the most important ways to recruit and maintain the best talent is to offer a competitive benefits package. As premiums for health insurance continue to rise in the individual market, offering group coverage is effectively mandatory for any competitive benefit offering. Although there are still a number of choices in terms of health plans that can help set you apart, it is with voluntary benefits where you can really make a difference. Making sure that you offer competitive dental, disability, life, and other coverage, will go a long way to recruiting and retaining employees. There are a number of studies which link good oral health to better overall health. Thus, an important part of keeping your employees healthy and happy is to ensure they have access to dental insurance. Dental offerings can be a relatively inexpensive option for your employees. We will be looking at dental plan design in a later post, but most plans offer coverage for basic and major services. For your employees with children or who may require adult braces, there are plans which offer an orthodontic component. Dental plans are usually available to employers with ten or more employees, but there are exceptions. Given their cost and the known importance of oral health, dental insurance remains one of the most common and desired types of voluntary benefits that employees look for when evaluating a benefits offering. Vision is one of the most cost effective voluntary benefits. With plans costing as low as $4 a month, employees who require glasses or contacts can receive a substantial benefit. An eye exam is included in most health plans. So why offer vision coverage? Vision plans are often material benefit plans. This means that they provide significant savings if your employees need to purchase glasses or contacts. The material discount can provide assistance with frames, lenses, contacts, and other necessary vision correction. With around 75% of the adult population requiring some form of vision correction, this is an excellent benefit that would appeal to many employees. Even with good health insurance, the fear of an extended illness or disability leaving an employee unable to work and collect an income is common. Fortunately, disability insurance exists to cover the gap when an employee is unable to work for an extended period of time. Both Short Term and Long Term disability are available. Short Term disability protects an employee when they are unable to work after several days due to the same condition. These policies typically pay for 13 weeks, and can be used to cover absence due to pregnancy, as well as illness or accident. Long Term disability comes into effect once an employee has either exhausted their Short Term coverage or after 90 days of absence. Long Term benefits pay usually until the Social Security Normal Retirement Age. Short Term and Long Term disability benefits are an important part of any benefit offering. They ensure that employees have a sense of security should they experience an unexpected illness or accident. These are plans that can be designed around your needs and the needs of your employees. Some employers cover the cost of these for their employees. Others offer the disability coverage as a voluntary benefit. Either way, disability insurance is a reasonably cost effective way to ensure your employees have some peace of mind in the event of a health crisis. A recent study found that 40% of Americans can’t afford a $400 emergency, meaning that many cannot live on their savings. Protecting your employees’ income is thus a vital and popular benefit. 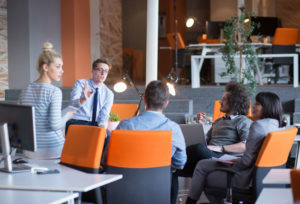 Many companies provide a group life and AD&D policy for their employees. This benefit is often included to ensure that employees’ families are take care of in the event of death. However, these benefits often have a modest amount of coverage, sometimes not covering the employee’s annual salary, for example. In these cases, it can be a positive benefit to offer your employees the option of adding voluntary life and AD&D coverage. Whether on top of existing group coverage, or as a standalone benefit, voluntary life and AD&D is an important way to ensure that your employees have peace of mind for their loved ones if the worst should come to pass. An often overlooked benefit, Accident coverage can be very popular when offered to employees. Accident coverage provides a set payout in the event that a person is injured as the result of an accident. These payout vary, but they are often enough to help cover the incurred medical expenses that result from the accident. Accident coverage also works well in tandem with disability coverage. It can help to cover initial expenses until any Short Term disability benefit pays out. Finally, many accident plans offer a wellness benefit. This benefit pays employees if they receive their routine physical or vaccination during the course of the year. This payment can help defray some of the cost of the coverage itself, and has the added benefit of encouraging your employees to get their annual physical! We’ve presented here some common voluntary benefits that employers offer. These benefits can help you to round out your benefits package in a way that won’t break your budget. It also allows your employees some control over the benefits they want. If you’re interested in learning more, or want to add some voluntary benefits to your benefits package, please contact us! We can be reached at info@morganplan.com, or by phone at 612-492-9320. Open Enrollment is an exciting time. It is a chance for you to review the benefits you offer to your employees, and make changes or additions. It is also a time for your employees to make decisions about their insurance plans for the coming year. Remember, employees will be not be able to enroll in your group health plan if they waive coverage during open enrollment, unless they have a qualifying event. It is therefore important for you and your employees to have regular communication, especially if you’re going to be making changes to your plans. Open Enrollment can also be a stressful time for your employees, as plan changes come into effect and premiums increase. This can lead to confusion and dissatisfaction. It is important that you keep in regular communication with your employees, so you can manage expectations and resolve complaints before they turn into larger problems. In order to keep your employees happy, and ensure that you have a successful open enrollment, we’ve compiled a few tips to help you out! One of the inevitable points of contention during open enrollment is the increasing cost of insurance. This mostly concerns health insurance, but applies to dental and other voluntary benefits as well. Premium increases occur during open enrollment, and premiums are often a top concern for employees. Further, they will certainly notice when they are paying more for their premiums than they were the year before. First, it is important to address these concerns by ensuring your employees know that you have shopped the market. Much of this is done by your broker, but we keep in touch as we look across different carriers and plans. It can also be useful to demonstrate the pricing on the individual market, which is typically more expensive than group insurance. Finally, by encouraging preventative care, employees stay healthier, which affects the overall premium cost. With benefit changes, there is always an initial amount of uncertainty among employees as they are unsure what their new benefits will be. Particularly compared to the old benefits package, employees may express dissatisfaction over rates (as discussed previously), network and service coverage, and customer support. During these times it is important to make sure that employees stay informed of the changes so they feel as though they are in the loop. 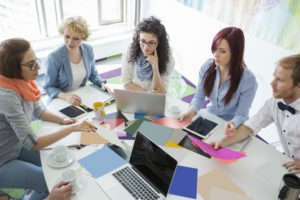 Benefit meetings, both on a group and individual level, go a long way toward educating your employees and easing their concerns. If you are changing carriers, be sure to highlight the benefits that the change will mean. These could be a lower premium, a wider network, or a richer benefit. If the provider network will be changing, work with your employees and your broker to make sure that they have access to an in-network provider they trust. And if the coverage benefit is changing, be sure to highlight the premium savings or increased coverage over the old plan. Employees are more likely to feel concerns about benefit changes during open enrollment if they have not been consulted during the process. Both during open enrollment and around halfway through the plan year, it is a good idea to check in with your employees to determine how they feel about their benefits. What is working? What isn’t? Are they any benefits they don’t currently have that they would like? Do they feel knowledgeable about their benefits? Education about benefits leads to higher happiness among employees regarding their benefit package, and can be a helpful tool during open enrollment. Also, employees who are well educated about their benefits can provide more meaningful feedback on benefit surveys as you continue to tailor your benefits package to meet the needs of your employees. Open Enrollment is an important time of year for you and your employees. A successful open enrollment can lead to increased employee satisfaction and retention. In order to ensure that your Open Enrollment is the best it can be, it is important to manage your employees’ expectations. As premiums increase every year, it is vital to demonstrate the advantages, both coverage and rates, of group health insurance. Communication, soliciting feedback, and education are effective tools to make sure your employees understand their benefits, make informed decisions, and know that their opinions matter. Benefit meetings are one of the most important parts of open enrollment, whether they are group meetings or individual discussions. For those of our clients who would like to know more about the open enrollment process, or who would like to hold meetings with their employees, we are happy to provide those services. If you’d like to set up meetings, or just get more information, please email us at info@morganplan.com, or give us a call at 612-492-9320. 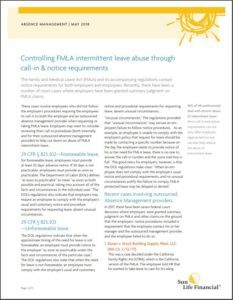 Do you have questions about the steps you can take to more effectively manage FMLA? Check out these tips from our partners at SunLife Financial! For those of you who have a high deductible health plan (HDHP), you may be wondering how to best take advantage of your plan. With lower monthly premiums but a higher annual deductible, an HDHP takes a bit of management to really maximize its benefits. HDHP’s are one of the main ways in which insurance carriers attempt to keep monthly premiums low. But that’s just one of the benefits that comes from having an HDHP and an HSA. An HSA, or Health Savings Account, is a special bank account you use to pay for medical expenses. Only those enrolled in an HDHP are eligible to establish and fund an HSA. Designed to work together with an HDHP, an HSA helps keep premium costs low. An HSA is a bank account that an individual is allowed to make contributions to throughout the year. There are different limits depending on whether the owner of the HSA has an individual or family policy. Those with individual coverage can contribute $3,450 during 2018. Those with family coverage can contribute $6,850 during 2018. You can then use these contributions to pay for qualified medical expenses. The logic behind the HSA is that, when used with a HDHP, it can help prevent major out of pocket expenses. The HSA is used to cover routine, smaller medical expenses, while the HDHP offers protection in the event of a major health crisis or emergency. One of the major benefits of an HSA is that any contributions made rollover to the next year. The funds are non-forfeitable, meaning they are yours until you use them up. It is therefore possible to build up a sizable savings that are available to help you cover medical expenses. The HSA is also portable. Even if you change jobs, or change plans, your HSA funds are still available to you. If you move from an HDHP to a non-HDHP, you cannot continue to make contributions to your HSA, but you can still use it to pay for qualified medical expenses. There are several advantages to making contributions to your HSA. One of the most important of these is that HSAs are tax-advantaged accounts. This means that every dollar you contribute to your HSA reduces your overall tax burden. Second, you can change the contributions you make to your HSA at any time. If you know you have a major expense coming up, you can make a one time contribution (as long as you don’t go over the limit! ), and then use that to reimburse yourself. Further, withdrawals from your HSA are also tax-free, provided they are used for a qualified medical expense. Thus, for tax purposes, it is important to save the receipts of purchases made using your HSA. An HSA is also a tool to fund your retirement. Individuals over the age of 55 are able to make extra contributions to their HSA. After the age of 65, all withdrawals made from an HSA are tax-free. In these cases, a long standing and well funded HSA can be another resource for retirees over the age of 65, as it can be used for both medical and other expenses. In addition to making contributions to grow your HSA, they also gain interest like any savings account. This interest is also tax free. Some HSA’s also have investment options, depending on the provider.